We’re now on Instagram so make sure you’re following us to keep up with all our latest projects and images. We’ve followed in the footsteps of our washroom division, Washroom Washroom, who joined Instagram a few years ago. We know that your time is precious so it’s a quick and easy way for you to keep up-to-date with all our latest projects. It’s an excellent way to showcase some of our favourite fit-outs and will be the ideal place to find inspiration for your next project – whether that’s seeing how we’ve incorporated a stylish storage solution or using a particular colour or material. One thing you’ll soon spot if you follow us is that no two projects are ever the same, which is something that we pride ourselves on. Our bespoke design service is at the heart of everything we do – we’ll create space tailored to your brief. Take a look at some of our latest case studies to see for yourself how we can work with you to realise your vision. To make it even easier for you to keep up with all our projects on Instagram, we’re using the hashtag #cre8ivitycaptured so you can explore our creative side. 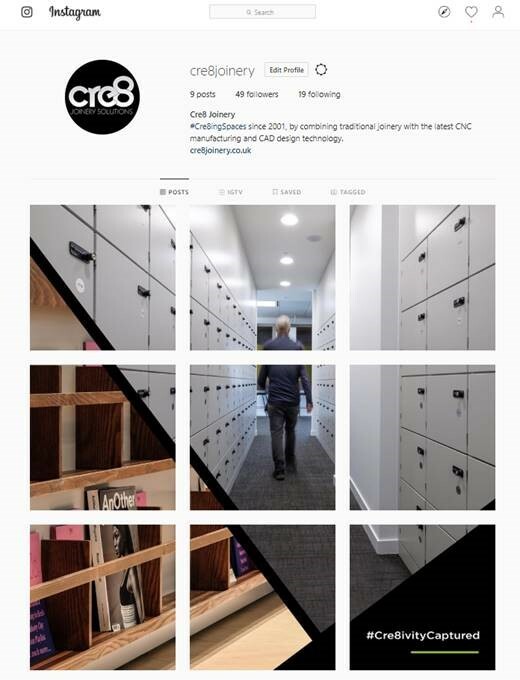 So if you’re on Instagram, make sure you check us out at cre8joinery and get inspired!